The Government of NCT of Delhi has dismissed the 1,775-page report of the Second Labour Commission as anti-labour and dubbed certain recommendations as “whimsical,” “arbitrary” and so “drastic” as to have far-reaching implications for social security of workers. Yet another brave son of this soil soldiered on despite enemy bullets and sacrificed his life while foiling the nefarious designs of the enemy across the borders who tried to infiltrate the country. The body of grenadier Surender Singh Jakhar of 29 Rashtriya Rifles was consigned to flames this morning in his native Jharli village amid the civil and military officials who laid wreaths on the martyr’s remains. Micro cities within NCR: Urban renewal or recipe for decay? 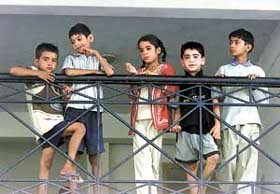 The indication by the Government of India that it is willing to change the landuse of plots where polluting/nonconforming industries once stood to allow for construction of a mix of residential and commercial structures has raised visions of urban renewal on scores of plots ranging from 20 to 120 acres in the heart of the National Capital Territory of Delhi. Surajkund, a well-known tourist spot famous for its internationally acclaimed arts and crafts fair, will now showcase commercial and industrial activities. The Maharshi Dayanand University has plans to introduce job-oriented courses like nursing and para-medical through the Distance Mode of Education from the coming academic year. The Haryana Government has been suffering a huge loss of revenue because of the unauthorised export of bricks to Delhi from Sonepat district. According to a report, at least 80 to 100 truckloads of bricks are being sent to Delhi by certain brick owners and they charge around Rs 2,000 for 1,000 bricks against Rs 1,350 fixed by the district authorities. One who is underprivileged or is not so fortunate as to have been born with a silver spoon in his or her mouth and at the same time does not want windfalls to be turned into millions overnight treads the path of righteousness and saves some money for a rainy day. 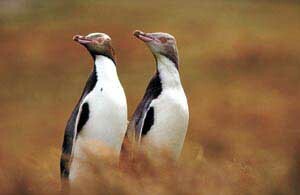 Glimmers of hope on the horizon? Union Information and Broadcasting Minister Sushma Swaraj is a public-spirited lady. She is a hardworking and sincere person. She always exudes enthusiasm and confidence. She easily wins admiration for having been made of sterner stuff. Addiction to liquor and drugs have ruined many homes and families. In some cases, wives, fed up with drunkard husband, have committed suicide while in some other cases, it has forced people to steal money and even commit crimes including murder. 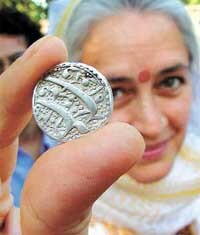 Nafisa Ali at a coin exhibition at Dilli Haat on Friday. Mike Whitney, host of the 'AXN Who Dares' at Dilli Haat in the Capital on Friday. The daughter-in-law of a businessman, Satish Chand, resident of Chandi Road here, has filed a case in Kotwali police station against him, his wife and some neighbours under the Anti-dowry Act. A married woman, Mrs Nirmala Devi, living in a rented house was electrocuted at Bahalgarh village about 10 km from here on Thursday. According to a report, she was clearing water from the roof of her house when she touched live wires passing over her house. The victim belonged to Darbhanga, Bihar. Ahimsa Vihar Apartments, Sector-9, Rohini, is witnessing religious discourses for the past two months, which will continue for another two months or so. One of the famous Munis of the Jain community ‘Rajesh Muniji’ has been residing here for two months, delivering pravachans and holding religious meetings. The Municipal Corporation of Delhi will hold four days Gandhi Jayanti Mela from September 29 to commemorate the birth anniversary of the Father of the Nation. 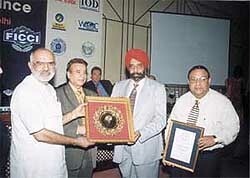 Mr S.S.Kohli, CMD, and Mr T.S.Narayansami, ED, PNB, receiving the Golden Peacock Award for excellence in corporate governance from Union Labour Minister Sahib Singh Verma. The Haryana Vikas Party supremo and the former Chief Minister, Mr Bansi Lal has charged the Opposition parties with misleading the masses regarding the construction of Sutlej-Yaumna Link canal. The members of the Pandit community from Kashmir staged a demonstration in the Capital today against the terrorist attack on the Akshardham temple in Gujarat. With the arrest of Charanjeet Singh Dabboo(30), son of Jagdish Kumar Chopra, of Maujpur, Delhi, and presently resident of Tulsi Niketan, Ghaziabad, UP, the North-East district police today claimed to have arrested the leader of the gang of bus robbers, who indulged in sensational bus robberies in the first week of September. With the arrest of three persons, the North-West district police today claimed to have solved a case of kidnapping for ransom, where a 22-year old boy was kidnapped to Darbhanga in Bihar and Rs 12 lakh was demanded by the kidnappers to safely release the boy. The Workload Meeting convened on Thursday despite the announcement on Tuesday that the meeting had been adjourned till next week as it was unable to reach a consensus on the workload issue. The final chapter of Delhi University Students’ Union elections concluded today with the announcement of the executive council on the campus. The 11-member Council is elected through indirect elections, which entail voting, by each central councillor and college president. 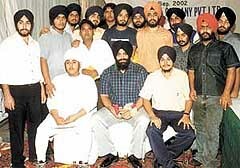 Mr Harvinder Singh Bawa, director, Bawa Masala Co. Pvt. Ltd., organised a felicitation function for the elected candidates from Shri Guru Teg Bahadur Khalsa College (morning and Evening) and Shri Guru Gobind Singh College of Commerce. A felicitation function for the elected candidates from Shri Guru Teg Bahadur Khalsa College and Shri Guru Gobind Singh College of Commerce. The Delhi High Court today directed the Centre and City Government to shift all the slum clusters that had come up in the capital after February 1997 to an area earmarked for the same. A Hapur Court has ordered the attachment of Trade Tax Department for its failure to refund the additional amount of trade tax deposited by a registered firm in the department. The Court order created a panic situation in the Trade Tax Department. Hosts St Francis De Sales School girls defeated Mira Model School 25-19,25-10,25-12 to annex the volleyball title in the first Fr Peter Mermier Memorial Invitational Inter-School Volleyball Tournament at the St Francis School court on Friday. Subodh Kumar played an all-round role (31 and 3 for 30) to help Basco Public School defeat Ramjas School No 5 by ten runs in the third Parle Cup Inter-School Under-17 Cricket Tournament at the Government Senior Secondary School, Vikas Puri. Naren Kumar of Team MRF, the defending Asia Zone Rally Championship and the country's leading rally driver, will be looking to extend his lead when the third round of the Motorsports Association of India's Indian National Rally Championship is flagged off from Goa on Friday. A dynamic all-round performance by Delhi Under-19 player Sandeep Karki (3 for 15 and 55 no, 8x4) helped Ravindra Public School, Pitampura, beat Manav Sthali Public School, Rajinder Nagar, by three wickets in a Group A League match of the Shaheed Smriti Under-19 Cricket Tournament for the Rameshwar Trophy, organised by the North Delhi Cricketers' Association, at the Ashok Vihar ground. A fierce bowling performance by Vishal Tyagi (4 for 24) helped Dena Bank beat Delhi Blues by 56 runs and entered the semi-final of the second C L Gupta Memorial Cricket Tournament for the Prem Lata Trophy, organised by K N Colts Club, at the Mohan Meakins ground. Apex School, Burari defeated Bal Bharti Public School, Rajinder Nagar 72-62 to win the Ramjas Inter-School Basketball Tournament title on Friday. Vikas of Apex, who scored 31 points, was adjudged the man of the match. His three-point shots were the highlights of the match. 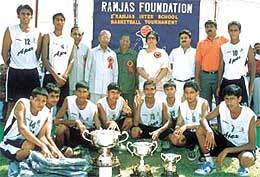 The Apex School team, which won the Ramjas Inter- School Tournament, with their prizes.